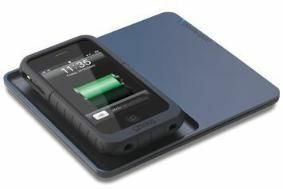 Charge your iPhone wirelessly with Gear4's PowerPad | What Hi-Fi? All you have to do is pop your iPhone 3G/3G S face up on the pad and it will begin charging. Where other wireless chargers rely on contact points built into a case connecting with contact points built into a charge pad (conductive charging), the PowerPad uses inductive charging, where power is simply transmitted through the case to the iPhone's battery. So your iPhone/iPod can be placed anywhere on the charge pad and does not require specific contact points and built-in magnets. The PowerPad is Works With iPhone (WWi) certified, and plugs into the mains to transmit electrical charge to the iPhone through the liquid rubber receiver case. The case also acts as a protective cover when you're out and about with your iPhone. It will be available for £80 in November from leading retailers and the Gear4 website.